John Severson "1995 Surf Culture"
Well known as the creator of Surfer Magazine, Severson grew up on the beaches of Southern California where his life revolved around sports and art. After receiving his Master's Degree at Long Beach State, he taught art at Laguna Beach High School. While stationed in Hawaii (in the army), he surfed and painted, selling his small watercolors on the hedge in front of the Royal Hawaiian Hotel. 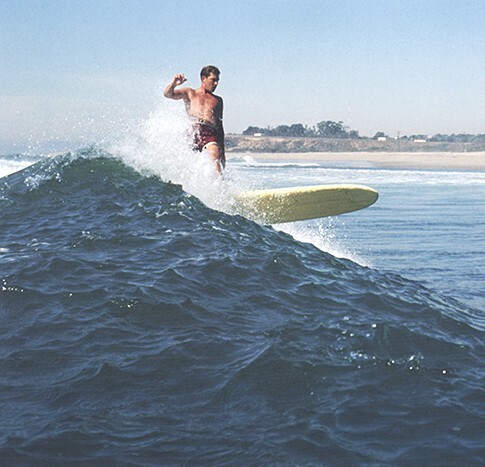 In pursuing his photography hobby, he shot 16mm movies of surfing which first showed commercially in 1958. 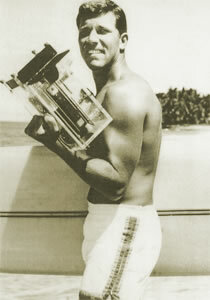 His successes include Surf Safari, Big Wednesday, Surf Fever, and Pacific Vibrations. In 1961, John's "big wave" skills won the Peru International Surfing Championship and was a finalist in the U.S. and Hawaiian Championships. With the founding of Surfer in 1961, John's art focused on the magazine and graphics. His cover painting entitled "Surf Be-Bop" was selected as the outstanding magazine cover on 1963. Also during the 60's, he wrote and photographed two books for Doubleday. Upon selling the magazine in 1971, John moved his family to Maui to pursue his art. He built his home in an island style, after a tree-house the family built and lived in for two months in Tahiti. He continues to paint and his work is featured in museums and galleries worldwide. One of the most notable being The National Museum of Berlin and Sports Illustrated Show in New York. His works have also been featured in Life, Sports Illustrated, Paris Match, and many Maui photo books. John's contribution to the surfing culture has continued through the years with numerous articles in world surfing magazine and in his fine art paintings.